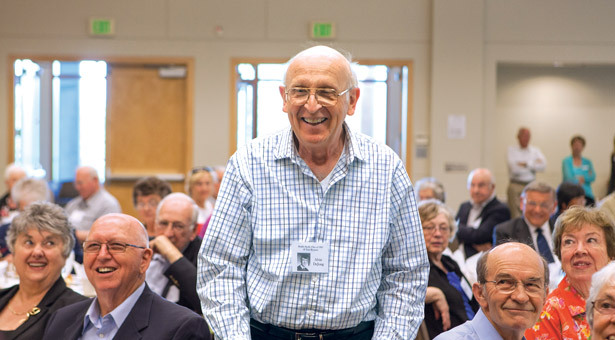 The Class of 1965 celebrated at their 50-year reunion. Photos by Luke Rutan. In September the Office of Alumni and Parent Relations sent an electronic survey to all Seattle Pacific University alumni asking for input on how to improve the alumni experience. Here are some of the key findings of the survey. Alumni have a positive overall attitude toward SPU. Recent alumni are more interested in career and professional programs and services than current students are. Alumni have forged strong relationships during their collegiate experience, both with their peers and with faculty members. Graduate-degree alumni believe the frequency that SPU is communicating with them is just right or not enough. While alumni have high levels of affinity toward SPU, peers, and faculty, they report lower levels of giving and philanthropy toward their alma mater than the national average. As part of the results of this survey, SPU is incorporating alumni feedback to make some changes to next year's Homecoming weekend (January 29–31, 2016). New events during Homecoming and throughout the year will provide even more opportunities for alumni to connect with one another and with SPU in meaningful ways. Stay tuned for more details, coming in the next issue of Response.